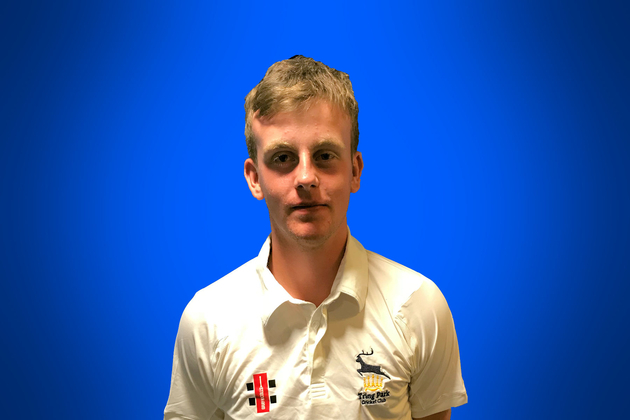 The Second Team beat Ruislip by 72 runs to maintain their second place in the table mainly thanks to excellent bowling from Lawrence Snookes (pictured) who bowled fast, full and straight to take four wickets, all clean bowled. After the game, captain Toby Wastling also commented on his very good slower ball. In his first spell he took the wicket of opener, Nik Mills, for 22 after a solid opening partnership of 43. He later returned to blow away the lower order as he took three wickets in thirteen balls and concede just one run to complete the victory. Charlie Greer took the second wicket thanks to a catch at slip high above his head by Richard Ambrose. This brought Stephen Windsor to the wicket, fresh from his century against Kew last week, but he lasted only eight balls as Greer found the edge of his bat for another slip catch by Ambrose. Chris Curry joined the attack in the 15th over and bowled the big hitters, Parminder Singh and Tim Bell to reduce Ruislip to 124 for 5. A win was all but guaranteed when Wastling chipped in with two wickets as the score slumped further to 131 for 7, before the re-introduction of Snookes brought up victory. Our total of 227-7 from 45 overs was less than had looked likely with the score on 134-2 from 23 overs. Will Darraugh was then bowled for 27 from 18 balls as played across a straight ball and in the next over Ambrose was caught behind for 48 from a ball that moved away. When Wastling was out for 12, Steve Dutch joined Ant McCormack for a sixth wicket partnership of 55. Dutch the upped scoring rate up with 30 from 36 balls as McCormack played the anchor role with his 41 not out. McCormack’s batting has shown very pleasing improvement this season. In early June he was playing for the Fourth Team, but has since played seven times for the Second Team scoring 142 runs at an average of over 35. A total of 227 was a little disappointing, but on a pitch that was clearly not easy for stroke play, we were confident of the victory that came.